Swimming Backpacks are most favorite among Swimmers. Our Swim Backpacks are large enough to carry all your swimming apparel and clothing. Speedo and Tyr Swimming Backpacks are what you see the most on Pool Decks. Swimming Backpacks - Top Ranked Product. A quality swim back pack is the perfect accessory for all swimmers. Gear and apparel needs to be stored and transported, and a swim back pack is designed specifically for these purposes. These backpacks incorporate many of the same technological innovations that have revolutionized the swimming industry throughout the years, and they are available in a variety of shapes and sizes that are suitable to any need. 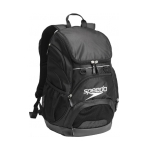 These backpacks are excellent for toting all of your swim gear, able to hold swimwear, goggles, towels, and warm-ups. Find all different size of Swimming Backpacks in this category. Even Though Speedo is our Most Popular Brand, we can actually mentioned that the Tyr Brand is growing fast, especially with their new "Get Down" version. Check it out at "Tyr Get Down Swim Backpack".